Cycads are one of TPP's favorite groups of organisms. Cycads are the dinosaurs of the plant kingdom, the oldest living lineage of seed plants with a history stretching back to the late Permian, real living denizens of Jurassic Park. Most people think cycads are palms and some common names (sago palm) suggest as much, but cycads are really, really different. Generally cycads are more similar to ferns. They have fronds that develop from fiddle heads and they have their sporangia on modified leaves. 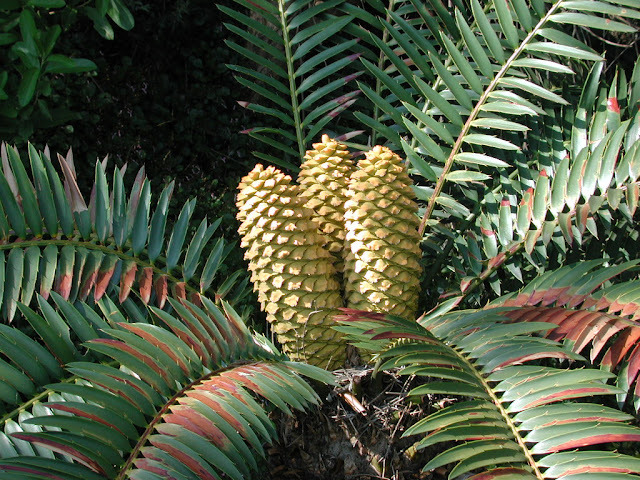 Among gymnosperms, cycads are the only organisms that are predominately insect pollinated. Our glasshouse has 8 of the 11 genera, so that will keep my students busy for awhile looking for cones, fiddle heads, coralloid roots, and all the rest. The specimen shown is a species of the southern African Encephalartos bearing seed cones. Prunophobia? Don't stand too close! Who took the preserved ginkgo? Water, water, everywhere - NOT! First day of spring - hardly! Uh oh! Missed my anniversary!